Dubai, 25 March 2019 – As the immense scale of devastation is becoming apparent in Mozambique one week after Cyclone Idai, humanitarian workers and journalists face huge difficulties in gaining access to the affected areas and establishing communications with the outside world. 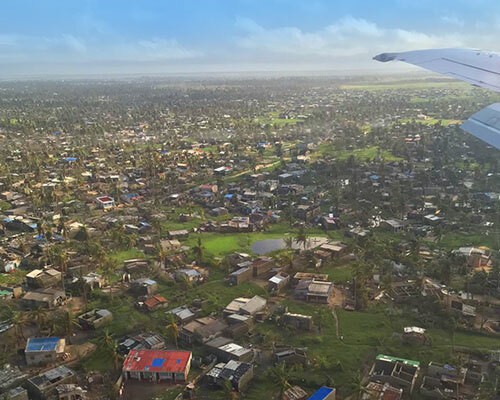 Aware of the challenging situation, the International Humanitarian City (IHC) has deployed its light flyaway communications kit to Mozambique’s Beira city to provide connectivity services, in partnership with Inmarsat, to both aid and news organizations on the ground. This is the first official use of the new emergency communications equipment after the launch of IHC’s Flash Studio Project two weeks ago during Dubai’s International Humanitarian Aid and Development Conference and Exhibition (DIHAD). The project aims to offer a solid bridge for communications between the field, media outlets, and the humanitarian community allowing field staff to share first-hand information in studio-grade quality live video links during emergencies and disasters. Cyclone Idai has severely affected the lives of 1.5 million people in Southern Africa, claiming the lives of hundreds in Mozambique, Malawi, and Zimbabwe. At least 410 people were killed by the storms and floods in Mozambique alone, and the death toll could climb higher. Many bridges and roads have also collapsed, and at least 15 000 people are still awaiting rescue as they cling to roofs or are stuck in trees. The threat of cholera and other water-borne diseases is now rising. Meanwhile, the IHC Task Force composed of IHC staff and representatives of prominent humanitarian organizations held a meeting yesterday morning to coordinate relief efforts emanating from Dubai. A 97-metric-tonne shipment of humanitarian aid was airlifted from Dubai last Tuesday, and four additional airlifts are scheduled for this week.